A fortnight ago, K. and I spent a lovely weekend on Hiiumaa, Estonia's second-largest island, which you can reach in about an hour on a ferry. There were our friends Siobhan and Meelik and their newly restored country house, there was a folk music festival, a wild boar farm, lots of green strawberries (Fragaria viridis, which are close relatives of wild strawberries or Fragaria vesca L.), beautiful sandy beaches. There was also a lively country fair in Kärdla, the main town on the island, where we stocked up on local honey, bought some new lamb wool pillows, and a trio of different carrot marmelades. Several stalls at the fair offered angervaksajook or a meadowsweet cordial, which reminded me of elderflower cordial that was a popular summer drink in Scotland. Neither one of us had ever had - or heard of - meadowsweet cordial before, so we were excited about discovering something new, and inquired one of the sellers about the drink. Meadowsweet, you see, grows wild everywhere on the island*. Or almost everywhere on the island, as after we had received the instructions from one of the drink sellers, we headed back to our guesthouse, keen to make meadowsweet cordial ourselves. The 25 kilometre journey back home went past a field after a field covered with flowering meadowsweets. Yet when we reached the place we were staying, we found ONE lone meadowsweet plant on a huge field behind the house!!! Luckily, we did manage to pick 50 blossoms from that single plant after all..
Meadowsweet**, as Wikipedia helpfully explains us, is a perennial herb that grows on damp meadows in Europe and Western Asia. It's also known as Queen of the Meadow, Pride of the Meadow, Meadow-Wort and Bridewort. Meadowsweet is known as Mädesüß in German, Reine-des-prés or fausse spirée in French, älggräs in Swedish, mesiangervo in Finnish. It's an excellent plant for attracting bees, as it's delicate and creamy-white flowers have a strong, sweet smell. Meadowsweet has been used in herbal medicine - apparently it relieves headaches and reduces fever and cures acidic stomach. This being a foodblog, however, I should focus on the culinary uses of meadowsweet. My Estonian sources didn't describe any (apart from using it to make healing infusions). But Wikipedia says that meadowsweet can be used to flavour wine, beer and vinegars, the flowers can be added to jams and stewed fruit. And last, but not least, meadowsweet is considered to be a sacred herb by Celtic Druids, who use meadowsweet to enhance their love spells! 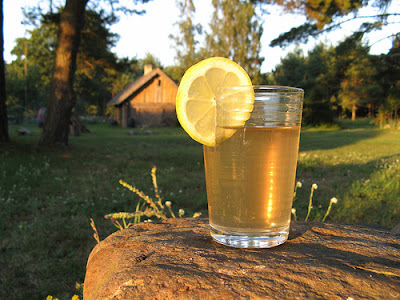 Here's a meadowsweet cordial, prepared according to the recipe of a friendly stall-holder at Kärdla country fair. A lovely, fragrant and summery drink with a difference. Pour the water into a large saucepan and add meadowsweet flowers. Bring to the boil, then add sugar and stir, until sugar has dissolved. Turn off the heat, add the juice of one lemon and let the flavours infuse. Drain through a fine sieve, season with more lemon juice (and sugar, if you wish). Serve diluted by water (1 part cordial and 1-2 parts water, depending on your preference), adding ice cubes and garnishing with a lemon slice. ** Note that what is commonly known as meadowsweet/white meadowsweet in the US, broadleaf white spirea or Spiraea Alba, is a somewhat different plant (thought information on the web is somewhat confusing. They're both in Rosaceae family). 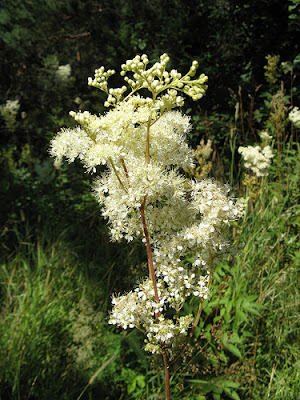 *** Make sure to collect your meadowsweet flowers from clean environment, avoiding the ones growing next to busy roads. WHB: This is also my entry to the Weekend Herb Blogging, this time hosted by Kalyn herself. Click on the logo below for more information about this established foodblogging event! Kalyn's roundup for the 94th round of WHB is available here. 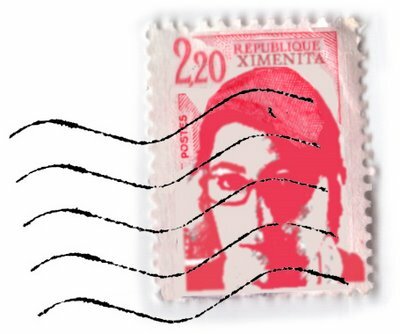 Very cool post! I haven't seen that plant here that I know of, but I love hearing how you find these interesting things. Great photo of the glass with the scenery in the background too! Interesting post - the cordial looks sooo refreshing! Once again, you have introduced me to a taste and ingredient that's completely new to me. Thanks, Pille! My wife and I were discussing this type of drink just this evening. What serendipity! I'm surprised, though, that there is no alcohol in it; it's going to have me re-think quite a few things that I've read, as in stories, as they've not necessarily been drinking alcoholic beverages. Somewhat like "small beer" or "small ale," I guess? that picture at the bottom...it´s my Estonian dream cristalyzed. I´m so happy to leave this baking hot place for a couple of weeks!!!! This is off the subject but I am hosting two Estonian teenagers tomorrow and I'm wondering what they might like for breakfast. Suggestions? Hey, just stumbled upon your weblog today.. It looks very nice and I'm definately gonna try out some of your recipes. Especially the part about the wild strawberries made my mouth water again.. This year around Jaani I visited your country and had them for the first time in my life. Makes me sorry they're really hard to come by where I live.. But I still have the memory - and there's always next year ;-). I've heard of meadowsweet but never knew what it looked like. Sounds like the kind of weed you'd like to cultivate! Very enterprising of you to make a cordial - how similar is the flavour to elderflower? i m truly enjoying reading about all the juicy bits u make from ur forraging trips with K.
Lydia - thank you for reading about it! Ka - tänud! Kuni nad seda praamisõitu veidi kergemaks ei tee, proovin saarelesõitu vältida (esialgu)..
Jeanne - it tasted similar to elderflower in the the herby, sweet and fragrant way. It's not as refreshing as elderflower, perhaps, and not sure I'd drink it on a daily basis instead of water. But it'd definitely make a wonderful party cordial or a base for cocktails! We think you'd come across Generic Viagra Blog and post something good. By the way you need to change the style in this.